First I would like to apologize for my absence. My family has lost my beloved Grandfather who, along with my Grandmother, was a huge inspiration for Postcards In The Attic. While he is greatly missed by his family and friends, he had a very rich and full life. Now at the age of 93 he will finally be reunited with my Grandmother after what must have seemed to be an eternity in itself. Rest In Peace, Grandpa. And when they came into the house, they saw the young child with Mary his mother, and fell down, and worshiped him: and when they had opened their treasures, they presented unto him gifts; gold, and frankincense, and myrrh. 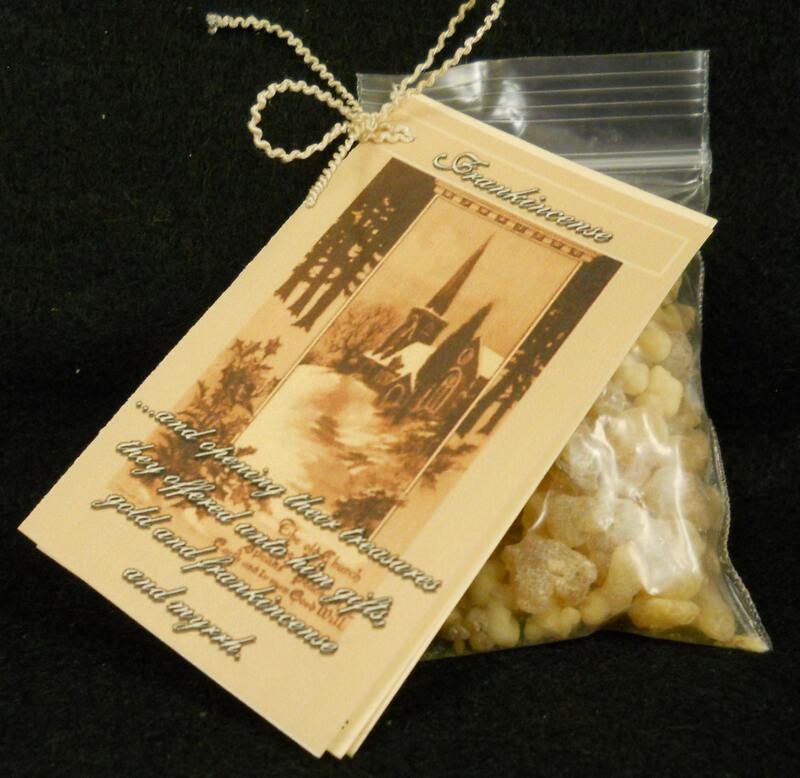 In the Bible Frankincense was traditionally used at that time as incense and in anointing oils. The resin is produced by slashing the outer bark of the tree and allowing the sap that runs from it to harden into little "tears." These are later "stripped" from the tree, thus why there are sometimes little pieces of bark found within the tears when you purchase them. 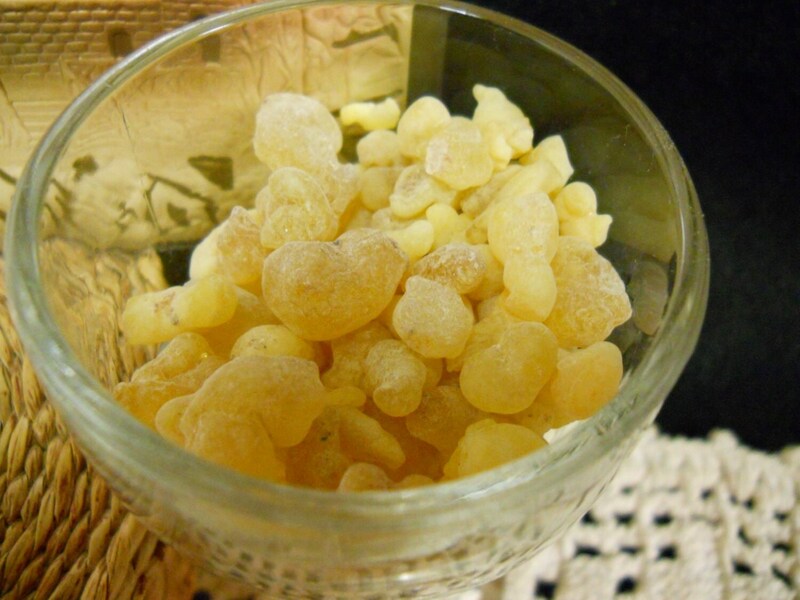 Frankincense essential oils are distilled from the resin not the leaves or bark themselves. This fragrant oil is used in baths and messaging oils (anointing oils during ancient time) because of its calming affect. One of its contributions to aromatherapy is the ability to induce a deep breathing, making it a very useful sleep aid and to enhance meditation. It also boasts of properties that will help rejuvenate the skin, making it a great ingredient in cosmetics and women's facial creams. On a more metaphysical note, Frankincense is burned (alone or with other resins such as Myrrh) as an incense to invoke Angelic hosts to religious ceremonies and prayer. Many believe (myself included) that merely having Frankincense on your alter will draw positive energy pushing away negative while you are meditating or in prayer. To used Frankincense as an incense, simply make a bed of hot charcoal (following all the standard safety precautions you would using any incense) and place a few tears on top and allow it to smoke. For a calming bath you can add a few drops of essential oil to your bath water or use some of the lovely products found on ETSY. The oil can also be placed in a diffuser or a vapouriser to benefit from its affect on the respiratory system. As with all essential oils and natural product, it should never take the place of medical treatment. Consult your physician prior to using any essential oil or aromatherapy to make sure it is safe for you and always conduct a skin test for allergic reactions.